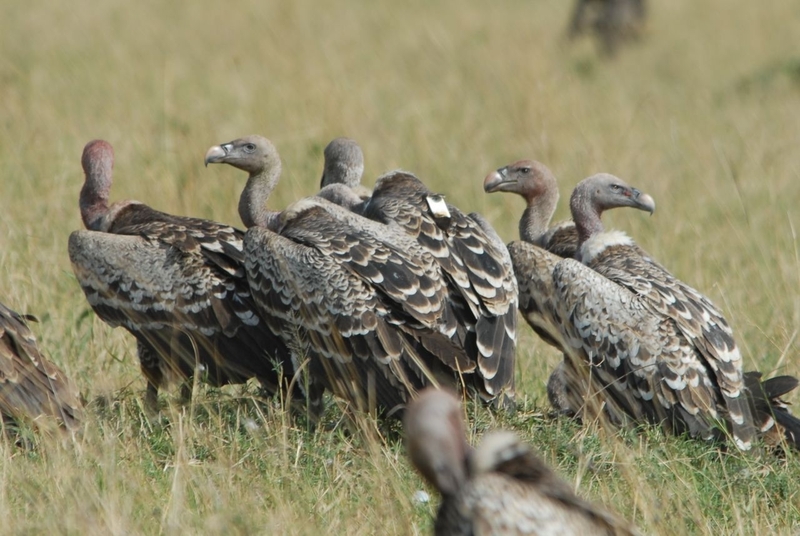 I was admiring the usual hoopla of twenty vultures grappling for a small kill when a few of the Marabou storks wandered behind the vehicle. They seemed to have found something more interesting than the meat in front of them and I turned around to see what they were up to. A small black lump sat on the ground about 100 meters behind us and the Marabous rushed it in their usual excitement to have found a new food source. 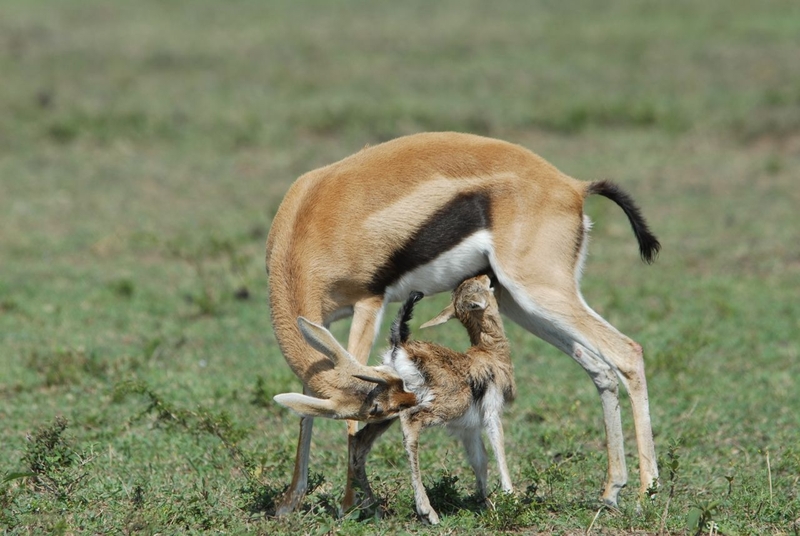 But their joy was short lived as an angry Thompson gazelle mother, tail still raised from the pain of having just given birth, came rushing at the much larger birds. Tiny horns pointed forward she chased the birds away from her very new calf. 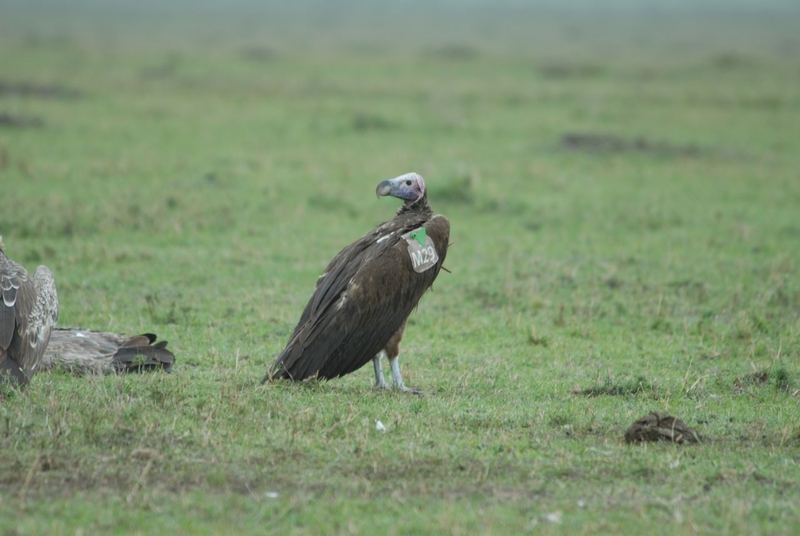 As the Marabou storks scattered, a Lappet-faced vulture landed to see what the commotion was about. It too was chased off within moments. Predators evaded, the mother now stood licking her newborn, pushing it to stand as she cleaned it of the afterbirth. The calf seemed tired but alert and tried straightening its little legs in a hapless effort to get up. It took nearly forty minutes, but the calf finally found the strength, motivated it seemed by the swollen teats of its mother that hung just behind its reach, and stood wobbly for the first time. It latched on and suckled as its mother continued her cleansing. For the past three years, I have been adamant that it would be impossible to re-trap a tagged vulture. The birds simply go too far – spending much of the year outside of the Mara in areas where I can’t trap – too quickly and are thus difficult to locate even when a backpack is sending you their location. Today I proved myself wrong. Lillian is a young Lappet-faced vulture that I trapped in April of 2010. She currently has the longest working GSM-GPS unit and has been reliably sending her location four times a day for the last 16 months, giving me an incredible amount of data. Lillian has become something of a favorite as I have also resighted her more times than nearly any other bird. After the initial trapping, we relocated her on a nest and were able to see her several times during those first few months when she was returning to her little home atop a small Gardenia tree each evening. Then in June I respotted her during some surveys in Serengeti National Park, Tanzania and starting a few weeks ago I had been seeing her every few days in the Mara. I had now seen her so many times that she seemed to be begging to be re-trapped so with the rains coming in we decided to give it a go early the next morning. The unit had stopped working about ten days previously and I figured this might be our last chance to take the unit off her. Re-trapping Lillian would give us several advantages. For one, it would give us an opportunity to see how she was doing and ensure that the unit and backpack were not harming her in any way and perhaps improve on design for the future. It would also give us an opportunity to get the unit refurbished, far cheaper than purchase of a new unit, we could send the unit back and get a new one made from the old parts at a fraction of the cost. Finally, we could remove the backpack. Although the Teflon straps should wear through on their own, it would likely be another year before the unit would fall off without our assistance. Thus if we could actually trap Lillian again we could take it off a bit earlier, saving her the trouble of carrying around a 100 gram weight with no working battery. At 5 AM I was up and ready for action. Would she still be roosting in the same tree? Would we really be able to catch her? What other dangers would be waiting for us in the bush around her roost? We drove out in the dark of night, spotlight in hand with a plan that had thus far never worked. When we arrived at the tree, we untied our newest trap of choice, a long pole with a noose at the end. The idea would be to spotlight the bird so she would sit still, while looping the noose around her neck. Then when she jumped from the tree we could carefully lower her to the ground and cut the backpack off. Last time we had tried this a pride of lions had followed us to the tree and I was a bit more wary this time as we stepped out of the car onto the dark savannah. I scanned around with the stoplight but no eyes appeared and we walked towards the tree with the pole. Everything was working well; Lillian sat calmly in the tree as I shined the light on her and my field assistant, Wilson had the noose only inches from her beak, but then she flew. I followed her down and found myself chasing after her on foot. In the dark, it seemed likely that she would be hesitant to take off and I might be able to sneak up behind her. She leaned forward as she trudged through the grass and I was amazed at her walking speed as I stepped gingerly behind her. After several minutes of walking I turned the light off for only a second, hoping to race up and grab her in the moment of darkness, but she took off again and this time I wasn’t able to see where she went. Realizing that I was now some distance from the car we turned around and hustled back, the moaning call of nearby hyenas following us as we did. The pole secured to the top of the vehicle we hatched a new plan to chase her while it was still dark. Now all we had to do was find her again. Given that Lillian is an 8 kg bird this might not seem so difficult, but she is also brown and can easily tuck behind a bush or into a grass tuff or perhaps strenuously flap her way back into a tree, so it took us an hour. When we finally found her the sun was just beginning to breach the horizon but it was still cool and the air was calm. Amazingly she was still on the ground and had probably been tromping around trying to avoid these unusual predators (us) for the last hour. She was already exhausted, so it wasn’t long before I leapt from the car again and found myself chasing her on foot. Running down a bird is a rather unusual experience. She was too tired to take off but that didn’t stop her from the occasional flap and she continually turned around (swiveling her flexible head) to squawk angrily beak opened wide. For my part, I just ran paying little attention to the other animals that hustled out of our way, my focus was the bird and nothing else. Eventually I caught up to her and tossed my jacket over her head. She lay down calmly in defeat and I quickly snipped the backpack straps removing the unit. She had a few missing feathers but was no worse the wear for caring our precious device for over a year. We had learned so much from her already but now she could go 100 grams lighter. When we pulled the jacket off she sat and stared at me, unsure how to proceed. I walked up and gave her a gentle push on the tail feathers, which was greeted with one last meager attempt at a bite. Then she was up and off again. When we came back to check on her a few hours later, we found her sitting happily at a new carcass (wing tag still attached so we could identify her). I wondered as I always do after a capture, if we would ever see her again. When something miraculous happens you don’t really expect it to happen again, so when we found another bird with a backpack that had given up the ghost I didn’t really think we could tr ap it. In fact it seemed fool-harden to even try, but the Ruppell’s vulture in question was already panting from its fights at the carcass and was very very full. The backpack in question had also slipped into a rather uncomfortable position and so I felt anxious to trap the bird not just to release it from the weight, but also from the discomfort of the unit. Plus, catching it would mean one more unit that could be refurbished and thus a bit more information that we could gain about these amazing birds. So with no further adieu we were off and chasing the bird. It didn’t take long until I found myself outside the car running alongside it as it turned its snake-like neck in my direction. Ruppell’s vultures are considerably more aggressive than Lappet-faced and I gave it some distance before finally throwing the blanket over its head. I pulled out my Swiss army knife and with four swift snips the backpack was off and the bird was on its way. Unit in hand I could now read the number and figure out which bird this was exactly (it didn’t have a wing tag like the other one). I had caught this bird in August last year in the Mara of course only to have its unit appear to stop working in December. It wouldn’t be until March that I got signal from the bird again since it made the longest journey of any of our study birds. This bird had gone all the way to Ethiopia and crossed into Sudan where it had spent nearly three months. Now a full year later it had returned to feed on the wildebeest in Kenya’s Mara and (unexpectedly for the bird) to suffer the same fate of being trapped again, though this time to have a little weight removed rather than added. I really couldn’t believe it – I had just touched a bird that had been to two countries that I have never seen, a bird that had travelled thousands of kilometers to be here again; a bird that had truly taught us something with the unit and would now gift us a little more information with its unit back in my hand. It is always an adventure to go to the Triangle. It is also rather far away. So we started off early and travelled to the two hours to the entrance along the Mara Bridge. There is only one bridge to cross the Mara and this is it (unless you dare to travel the long rocky roads to the north of the park which will take you out and around the mighty river). On our way to the bridge, we came across a carcass and we drove off the road to get a closer look. As we neared the rowdy flock of vultures, we heard a small bleating shriek, the noise of an animal making one last plea for life. Oh God, I thought, we ran it over. We looked left to see a reedbuck doe leaping from the brush and with eyes squinted closed in disgust, I looked right to see the inevitable – the calf we had run over. The brown fuzzy mass was more adorable than I could have imagined and lay flat tucked into a small sedge behind us. We reversed for a closer look. With a deep breath of despair, I looked at the small creature but there was no blood and no sign of a track mark. Was it dead? Suddenly the ears wiggled and I assumed the worst – we had injured it severely but not killed it. A friend joining us for the day stepped from the car and lay a hand slowly and gently on the animal’s back. The same mournful bleat emerged from its body and it pushed itself up on the wobbly legs of an infant designed for hiding and promptly, decisively, ran away. We hadn’t killed it after all. We had run over it, but hadn’t actually hit it, just covered it with the car for a few frightening moments. My feeling of relief quickly returned us to the task at hand and the observations at the carcass began. An hour later we were back on the road heading towards the bridge once more. 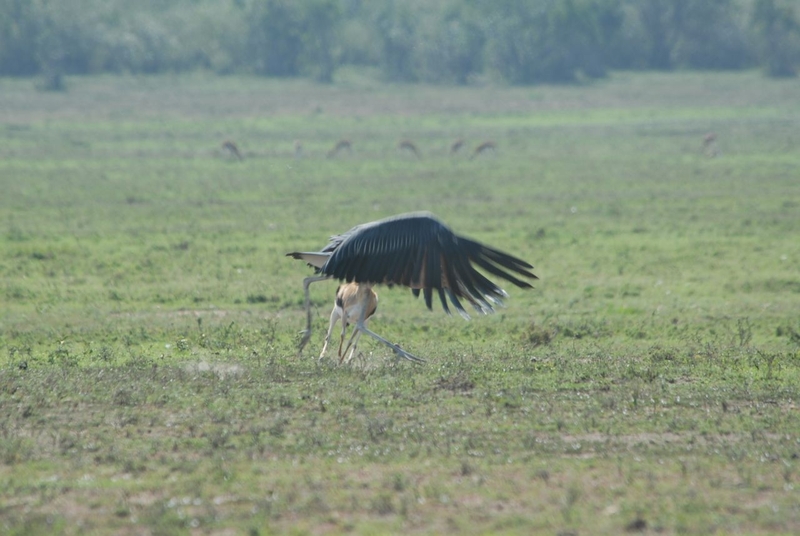 We arrived to find the stench of drown wildebeest and the sound of fighting vultures though the primary bird was actually the Marabou stork. These partially immersed and immensely rotten carcasses were perfect for their long wading legs and beak and they wandered around poking and proding each carcass with glee. After the usual negotiation with the rangers at the gate we made our way into the triangle. Just a few kms in we came across a group of feasting lions with vehicles a bit too close for comfort. 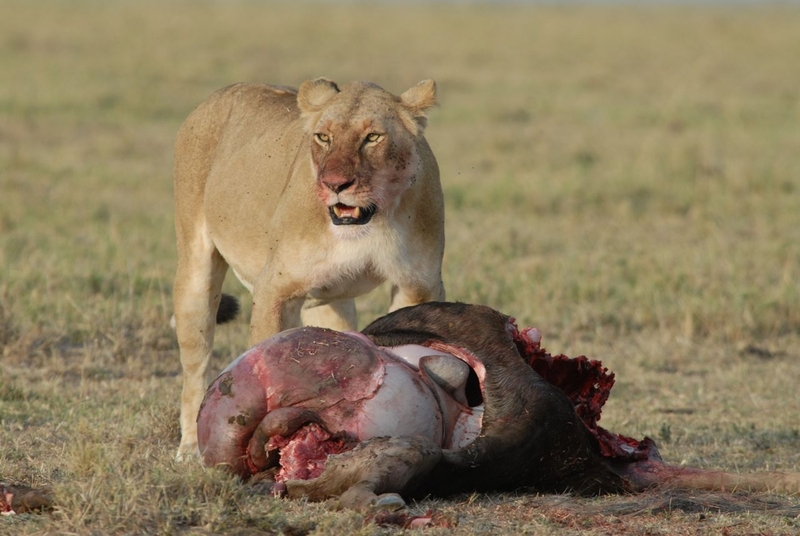 One was following the lions closely as they moved away from their kill and stopped with a lionness’ head just beyond the driver’s reach out the front window. A second lion moved to the back of the car and actually went under the car for a closer look. The lion seemed to be rummaging around under there and the driver drove forward in an effort to escape this unexpected attack. As he neared the road it was clear something was wrong. 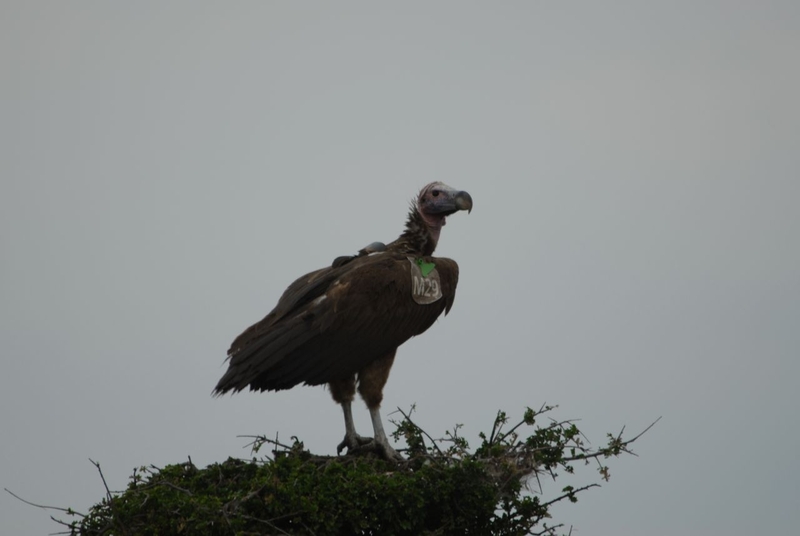 We had stopped along the road to watch a Hooded vulture and Tawny eagle who had arrived at the carcass and the tour guide now drove up to us looking for help. The lions had chewed through his fuel pipe he explained as he questioned whether we had anything he could repair it with. I gave him the dirtiest look I could muster for driving too close in the first place and then handed him a roll of duct tape. We continued on the main road until we came across another odd sight – two tourists out of the car, grabbing some glistening creature with their bare hands. I was confused, but mildly impressed. What brave ladies to go after a snake like that, but what were they doing? As we neared we could see the slimy bodies lying in the ditch along a large pool of water. Catfish had haplessly followed the stream to their dooms and these women were trying to save them. A rather sad, though valiant, effort that was unlikely to result in any real savior given the catfish would likely repeat their folly, but I grabbed a bucket and joined them (partially as Wilson had said he had seen a lungfish which would have been an exciting first for me). As a team we herded the fish into the bucket and I flung them back in the pond one by one. Satisfied that we had saved them all, the ladies returned to their vehicle and I refilled the bucket with our vulture trapping supplies before we continued on. It wouldn’t be until four hours later, when we passed the pond again, that I would realize that a hippo had been hiding there all along. How fortunate we were that the disturbance of tossing catfish had scared rather than annoyed it.